2001: A Space Odyssey is a countdown to tomorrow, a road map to human destiny, a quest for the infinite. It is a dazzling, Academy Award-winning visual achievement, a compelling drama of man vs. machine, a stunning meld of music and motion. It may be the masterwork of director Stanley Kubrick (who co-wrote the screenplay with Arthur C. Clarke) ... and it will likely excite, inspire and enthrall for generations. Tonight Ian and I went to see 2001: A Space Odyssey at the Bell Lightbox. Last time I saw it was on TV back, maybe in the early 90s. First time I saw it was with my Film Ed class in grade 9 at the Glendale theater where it played for over 2 years, and again at the same theater during its long run. I wondered how the picture would stand the test of time, especially with all the eye- popping computer graphics they have now. The Bell Lightbox showed the film in its original 70mm format and even had a short intermission, as in the original, to change up the reels. The special effects stand up excellent. I found some of the scenes way too long. I know the space scenes were to be an inter-galactic dance but they could of been half as long with the same effect. The story is slow moving but that was the way I remember it. I don't think many of today's kids would like the pace of the film, which is a shame. 2001, though, has one of the most memorable movie scenes ever. It's about a 20 minute sequence between Dave and a pleading HAL9000, the ship's computer, that no science fiction to ay could match. It alone is worth the price of admission. Again, I find the end totally weird but good for discussion. I'm real happy I went and saw this movie in its original format, the way it was show 42 years ago. I found this piece who was the art director for 20th Century theatres and operated the Glendale as a Cinerama venue. 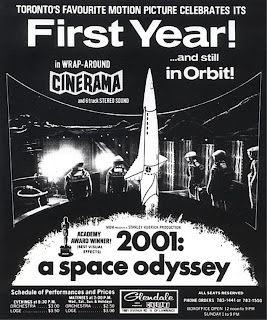 "Interesting anecdote about 2001 A Space Odyssey at the Glendale: not long before the picture opened, one of the bookers complained to me that they were contractually obligated to play this piece of crap for a minimum of 3 months. He was convinced that the weekly gross wouldn't even cover the house nut. Little did he know that the picture would have the world's longest run at the Glendale... 127 continuous weeks. Not just that, but it eventually came back and played the there for many more profitable months." 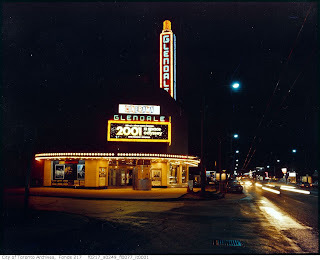 Note: the Glendale, like many other great movie houses in Toronto, does not survive today as it was demolished in 1975. 2001 is a great movie... wish I was there.